Chiang Mai is changing. Sometimes change is good and at the same time bad. Immediately noticeable is the increased cost of taxis from the airport into town, the uniformed drivers and their new cars and the increased number of cars in general on the roads. I know my perception of whether the change is good or bad. Really I wanted to know what the Thai think about it. Both people I asked said that it is good for the economy and bad for the culture. Long, the woman I met at one of the Body Pump classes I attended, summed it up saying that there are so many more Westerners and Asians, in Chiang Mai that she felt came here for what it was and have made it what they want to be. She is saddened by the changes. In an effort to avoid the touristy and changing old town, and to give me something new to write about, I decided this time to stay somewhere new. The fact that CM Blue House, the guesthouse that has been my home in Chiang Mai for the past 5 years, recently closed also aided that decision. So I opted to stay at Inspire House, just a short distance from Sunshine Massage School. Inspire House is actually not very inspiring. From the funky stale smell in my room to the tears in the fabric of the sofas in the lobby, it just didn’t make a very good impression on me. Perhaps a fresh coat of paint and a good cleaning of the mold in the bathroom would do it wonders. (To be fair, the fight against mold is a tough one in this climate.) After a day or so, what it lacks in aesthetics was more than compensated for by the luxury of daily housekeeping, two bottles of water a day and a primo location for me. Although lacking strong English speaking skills, the staff was kind and helpful. They helped me get a motorbike the evening I arrived, even though I thought I had arrived too late in the evening to rent one. My propensity for making Chiang Mai my home was definitely enhanced by being outside of the old town. During the day I took my massage class. In the evening I worked out, ran errands and went and had dinner. Having such a routine existence made the days fly by. Having taken several days off of actually working out, the lengthy walks through both Svuarnabhumi and Don Muang Airports on Thursday and Sunday notwithstanding, I needed to go do some exercise. Fitness Thailand offers classes in the evening and Monday and Wednesday were Body Pump class. The instructors are pretty good at leading the class in some combination of Thai and English. Enough English that it wasn’t hard to follow along at all. Also helps that I have been doing Body Pump classes at home so knew the general pattern and moves. Wednesday evening I arrived at Fitness Thailand running a little behind due to unexpected traffic and a slight navigational issue. When I went to pay I discovered that I didn’t have my wallet with me. No money and no ATM card. Pleading my case to the receptionist, she let me take the class on the promise that I would come back and pay. So after class, I jumped on the motorbike, zoomed back to Inspire House, had a slight moment of panic when my wallet wasn’t where I thought it might be, found my wallet hiding in my backpack, grabbed my wallet, and zoomed back to Fitness Thailand. Times like this are when I am extremely happy to have a motorbike to get around and am generally familiar with Chiang Mai roads. My inner mermaid was starting to get cranky about not getting in the water, so Tuesday, Thursday and Friday I opted for swimming. Eco Resort, a common location for many Sunshine Massage School students, has a beautiful 25 meter pool. Generally the pool is not crowded, making it fairly easy to swim laps. Sophie, one of the students in my class, was staying there and was at the pool on Tuesday and Thursday. Both days she made the comment that I never stop after watching me jump in the water and swim around 1000 meters each night. The clean, lightly chlorinated, cool water was a welcomed way to end my days. The most important errand of the week was getting my computer repaired. Upon Lek’s recommendation, I took my computer to the second floor of Panthip Plaza where I found Chiang Mai Notebook Repair. Presenting my computer to them and explaining the tragic incident that had befallen it, I looked at them hopefully and asked if it could be fixed. To my great relief, they said yes. The price for the repair would be 800 baht or about $27. The relief of having my computer fixed and not having to type on my phone washed over me like a wave. The prospect at having to find an alternative or paying a large amount had been weighing on me. No trip to Chiang Mai is complete without going to the Sunday Night Walking Street (unless you are not there on a Sunday). Walking street is a market that materializes every Sunday evening covering several blocks running right through the middle of the old town. Walking is a relative term, as the number of people squeezing their way between stalls makes a turtle seem like a speed racer. Armed with a list but lacking the desire to do much shopping, I did my best to plod my way down the street and back up. Eventually I gave up and headed back to Inspire House, the realization that I would be forced to do more shopping at the Night Bazaar at some point during the week. The Night Bazaar is probably my least favorite place to go in Chiang Mai. Pretty much I view it as a feeding grounds for vendors as they ply tourists for their money. Probably doesn’t help that I don’t like to bargain for what I want to purchase, yet know that I have to as the prices the vendors give are inflated to catch the unsuspecting and inexperienced tourist unaware. Tuesday night, after eating dinner and meeting a new friend, we decided in solidarity to head to the Night Bazaar. Generally I was successful in getting several of the remaining items on my list, most specifically the massage tools that I have only ever found here. My general motto is to never stop learning. So this year I returned to Sunshine Massage School to take Thai Massage Using the Feet. Our class was the largest I have had there, 20 massage therapists from all over the Europe with a couple people from America and Turkey. Almost everyone in the class was a practicing massage practitioner with several years of experience. Having that much experience in the class was so beneficial as each of us brought a wealth of skills and perspective to the new techniques we were learning. The week of learning passed very quickly. When learning massage, it is important to work with as many different body types as possible. On Thursday I had the opportunity to work with Rogier. Rogier does a form of acro-yoga massage. As the name suggests, acro means in the air. The short term for acro-yoga massage is “flying”. Toward the end of our session, Rogier did some of this type of work. The experience was truly incredible. To be suspended in the air and moved through different positions requires a certain amount of trust and release of control. The most loving and tender part of the time was the ending where he returned to the ground surrounded in a hug. As he was doing this part and I looked around, almost the whole class was watching. Several people commented on how incredible it was to watch. And while I’m sure it looked incredible, it felt even more incredible to experience this type of work. One of the most beautiful aspects of traveling is the people that you meet and connect with along the way. People come into our lives at specific times and for specific reasons. And even though your paths may briefly cross, sometimes that person can have a profound effect, like a stone being thrown into a pond changes the water with the ripples it creates. My normal haunt for dinner is the Chiang Mai Gate market. True, it’s not very adventurous to eat at the same place every night; however, it is a lot like cooking your own food every night, just without the effort. Tuesday night at the market was crowded, with all of the tables filled. At one of the tables was an individual dining solo. Not being particularly shy and knowing it is generally a custom in a lot of countries to share a table with strangers, I asked him if could join him at the table. He said I could so long as I didn’t mind sitting among the trash. As I watched him try to eat his pad thai, I finally couldn’t take it any longer and gave him a lesson on the proper way to eat the noodle dish gracefully. Mike, an American turned Canadian, and I talked for a very long time about a broad array of topics interspersed with moments of very cerebral humor. The capricious amount of witty banter was much appreciated. It was the start of a very interesting friendship that grew over the next few days. Wednesday night we met again for dinner. When eating at the street vendors it is custom to order your food, eat and then pay before you leave. Mike is just one of those people where conversation comes easily. We were so engrossed at the end of dinner that both of us said our goodbyes and went our separate ways. Fortunately I was taking the long way around the outside moat road looking for a gas station, when I realized that I left without paying for my dinner. Taking the next turnaround I zipped back to the night market and paid for my dinner amongst a profuse amount of apologies. The vendor laughed when I apologized and said she forgot too. Massage class is a petri dish for meeting and connecting with people. The advantage is that everyone is there for a common purpose and has the fact that we are body workers in common. Having 20 people in class made it difficult to really connect with the group as a whole. Even by the last day there were a couple people whose names I didn’t even know. At the same time, it was possible to establish some very strong connections with people. Justine, a cheerful and kind woman from the UK, and I hit it off almost immediately. Sophie and Melody were also quick connections. The deepest connection I had was with Rogier, a wonderful and kind man from Holland. A testament to when the timing is right; we didn’t actually connect until we worked together Thursday afternoon, yet that connection had the most profound impact on my week. Just as important as meeting new people is seeing old friends. Many of my friends from Elephant Nature Park have moved away from Chiang Mai. Lek and Chai are the two friends that I have seen most consistently over my travels. Even though we don’t talk as regularly as we used to, we are still friends and still make a special effort to see each other. Friday night Lek and I were able to meet. She picked a meeting location that she knew I could find, just down from where I used to stay. I parked my motorbike, grabbed my helmet and jumped on the back of her cute orange, almost vintage looking, motorbike. First stop was dinner at a small place on Sirphon Road (the north inside moat road). I took one look at the menu which was entirely in Thai and told her to order for us. We had tom yum goon, fried fish with garlic, and vegetables. We spent dinner catching up and talking about the fact that we have known each other for 5 years already. After dinner, Lek felt like going to Zoe in Yellow, a bar that is popular for farang (foreigners) and for dancing. A friend of hers was there and invited us to join them at the table they were at. 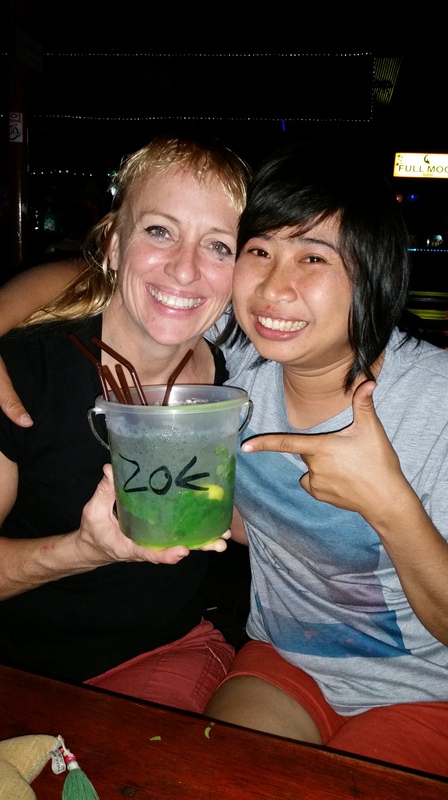 In retrospect, ordering the bucket of mojito for Lek and I might not have been the best move. Somehow by the end of the night, we did manage to drink the whole thing. In the process we ended up actually dancing for awhile. I haven’t danced like that in a long time. Was really nice to relax and enjoy spending time with a very dear friend. At the end of the night, which was about 1 AM, Lek drove me to my motorbike. From there she followed me all the way back to Inspire House just to make sure I made it ok.
Chai travels for his work, which is driving a van for tourists. Most often he is in Chiang Rai. In the blur that was my week, I forgot to contact him and let him know that I was in Chiang Mai, just in case he was able to meet me. Friday morning Chai saw the post of Lek and I on Facebook. Turns out he was in Chiang Mai for the night. Unfortunately for me, he had to work almost all day on Saturday. The beauty of my Thai friends is the lengths they will go to in an effort to see me. Typically I am ok with Thai time. When it comes to travel arrangements and Thai time, I struggle somewhat. Chai offered to pick me up at Inspire House and take me to the bus station so that I could see him for a few minutes. Saturday happened to be the day that the Chiang Mai Flower Festival parade was happening, making traffic a nightmare. The trip that would normally take maybe 5-10 minutes ended up taking him about 30 minutes. As the time grew nearer for me to catch my bus he finally said that it might be better for us to meet at the bus station instead. Arriving at the bus station at 6:05 for my 6:15 bus, I checked in my luggage and anxiously waited for Chai to arrive. Not having been to the bus station in a long time he didn’t realize that Nakonchai Air now has its own terminal in the bus station complex. Mere moments (6:11) before I needed to be on the bus he made it there to say hello. It was good to see him and I felt guilty that we didn’t get to spend more than those few brief moments. At the end of a very full and very quick week, it was time for me to head south to Buriram. The bus ride from Chiang Mai to Buriram is a 12-hour overnight trip. Fortunately the buses Nakhonchai Air uses are very comfortable, especially the VIP seats at the front. For $24, the VIP seats are worth it as they almost fully recline. Part of the bus experience in Thailand is the sometimes too loud Thai music and then short movie. Fortunately with the overnight trip, about 3 hours in they turn the tv off so everyone can sleep. Until then I made a valiant attempt to drown out the noise using my iPod. Ever since I have come to the Surin Project, I have wanted to make a trip down to the Prasat Hin Khao Phanom Rung ruins. Generally my travel plans have prevented this from happening, so this time I made a special effort to get there. Prasat Hin Khao Phanom Rung is a former Khmer temple that was part of the Khmer empire that extended from Angkor Wat in Cambodia deep into Thailand in the 9th to 11th centuries. The temple is also the best example of Khmer architecture in Thailand. The ruins are located a mere 70 kilometers or so from Buriram. 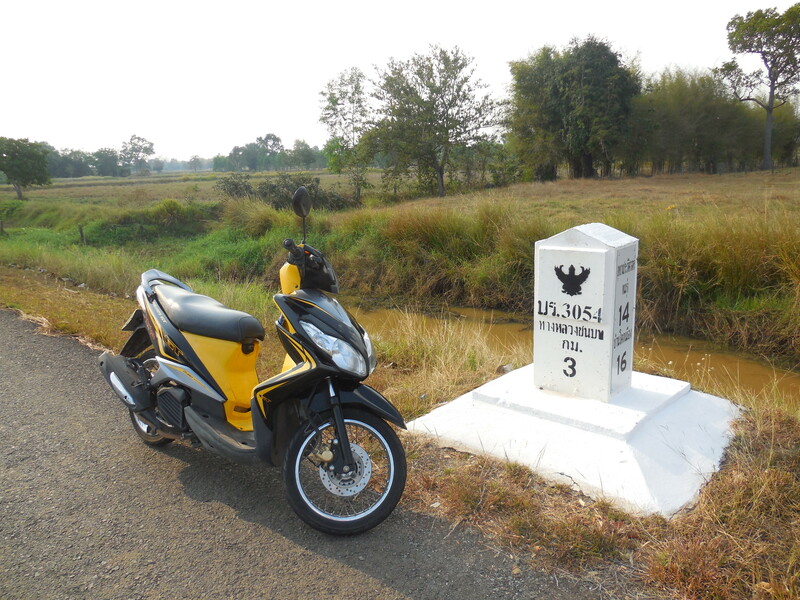 The options for getting there are to take a bus to a small town and then a motorbike taxi from there, hiring a taxi from Buriram or renting a motorbike. As is my way, I opted for the motorbike. When I went to rent a motorbike from the place I was staying, you would have thought that I suddenly sprouted a third eye the way the woman looked at me. After emphatically suggesting the taxi approach and me emphatically insisting on motorbike, she helped me locate a place to rent a motorbike that included a helmet. Jintana Resort, where I am staying, has a motorbike to rent but no helmet. In Thailand, helmets are compulsory even if this law isn’t always particularly enforced for Thai. For farang (foreigners) the law is almost always enforced. Not to mention the safety factor. Armed with a not-to-scale map and a practice of holistic navigation, I jumped on my yellow and black motorbike that I immediately nicknamed Bumble Bee Jr. (after the transformer) and headed off. For those unfamiliar with the concept of holistic navigation, it is the practice of heading off in what you assume to be the right direction and hope for signs that you made the right choice. Occasionally this method has resulted in some interesting adventures to places I didn’t expect. This time, according to the blue tourist attraction signs, it worked out pretty well. Zooming down the road on a motorbike through the sun bleached plains, sometimes strange and interesting sights briefly catch your attention: cows grazing on the side of the road; dogs lying in the sun; motorbikes coming at you on the wrong side of the road; cars coming at you passing another car on a bridge where the road narrows, a large concrete Buddha being constructed on what I’m assuming is the site of a future wat (temple); tourist attraction signs for Thai Silk Village; large fiberglass crane statues marking the entrance to a bird sanctuary; the Thai Cowboy Hat Factory. (Who knew there was a Thai Cowboy Hat Factory?!) The most interesting phenomenon was the waves of cool air fighting with the hot midday sun. Even though the fields looked dry and brown, enough water must have been present to create a swamp cooler effect. 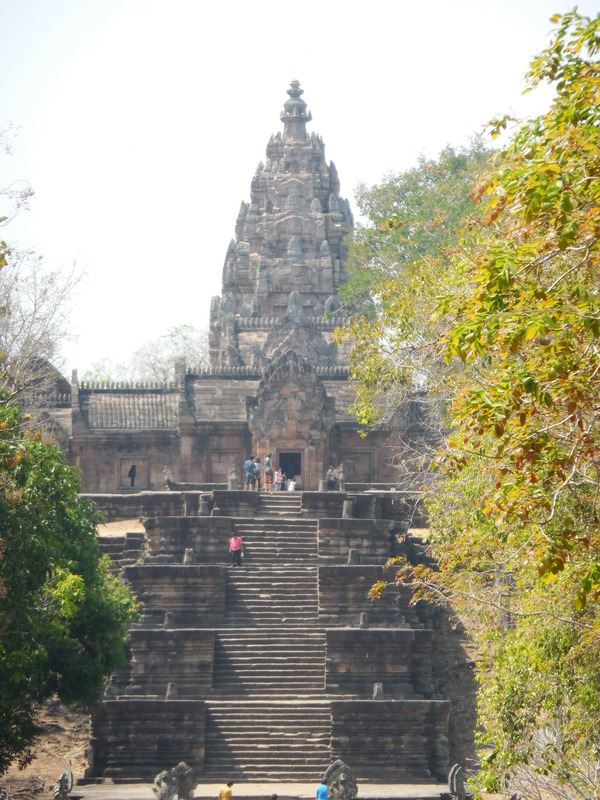 Prasat Hin Khao Phanom Rung is situated at the top of a dormant volcano. “The approach to the temple is pretty dramatic [when approached from the east]”. Unfortunately I read that part in my guide book after parking at the west entrance. To get the full effect I opted to climb down to the eastern entrance and then come back up to the main prang (temple building). The guide book was definitely correct. The approach is symbolic of the journey to the heavenly palace of the gods. The 200-meter-long avenue is paved in large stones leads to several flights of stairs leading sharply up the mountain. 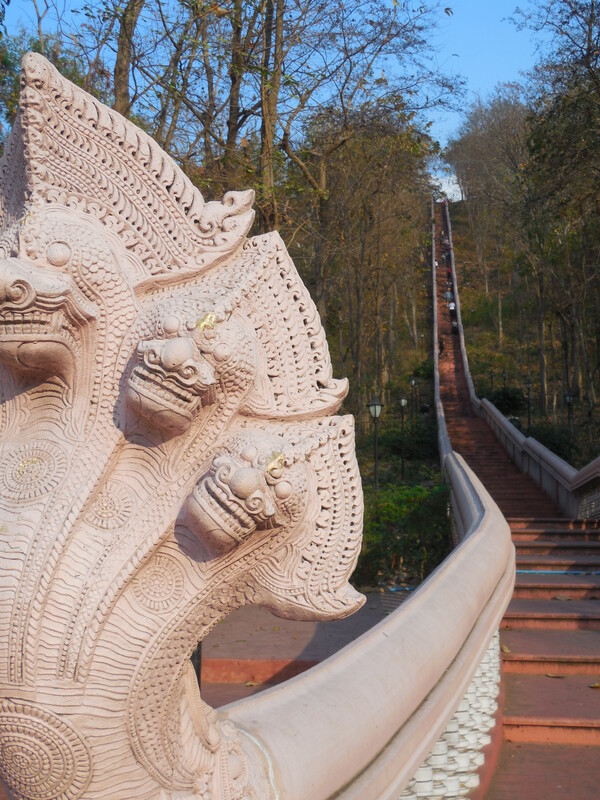 Along the way are bridges adorned with 5-headed naga (serpent) balustrades and the feet of what were once guardian sculptures protecting the path. While definitely not on the scale of Angkor Wat, the architecture that has been immaculately restored is impressive. The Khmer practiced Hinduism. The Buddha statues typical of Thai religious buildings are replaced with Shiva lingam, the sacred symbol of Hindu worship. The ornate carvings that adorn the inside and outside of the prang depict Hindu creation myths. The use of primarily stone in the construction has allowed these building to persist for centuries. Next stop on my tour was Prasat Muang Tam, located about 8 km down the other side of the hill. While not as impressive as Prasat Hin Khao Rung, the ruins are still fantastically preserved. 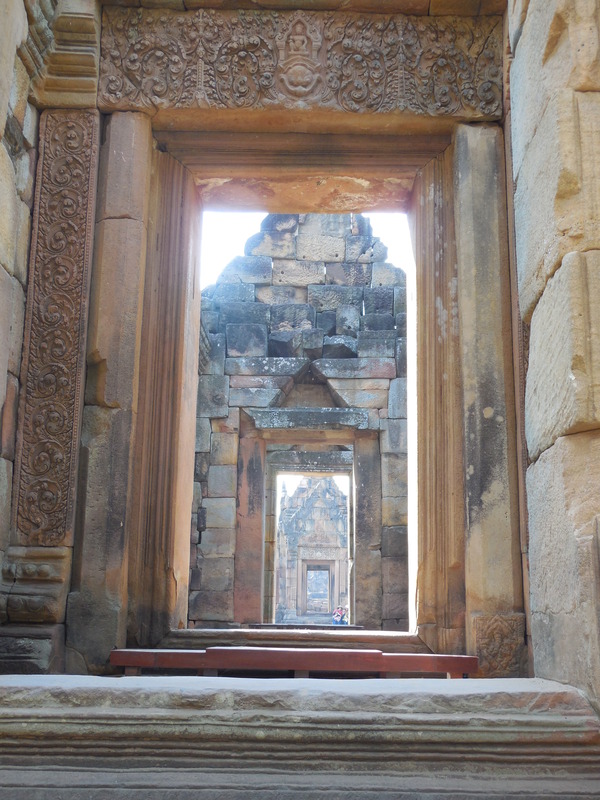 One of the features of Khmer or Hindu architecture is the symmetry of the buildings where the doorways between galleries and the inner buildings all are in alignment, creating an endless path that diminishes into the horizon. Again reaching my fill of ruins, I began the journey back toward Buriram. Relying on my holistic navigation and the desire to see a bit of potentially different countryside, I continued in what would be a loop back to Buriram. Doubting my sense of navigation at one junction in a small town, I opted to actually ask which direction to go to get to Buriram. Again, you would have thought a third eye suddenly materialized on my head as I told the gentleman that I asked that I was going by motorbike. He kindly pointed me in the right direction (which is the direction I would have taken) and after a typical chat of “where are you from, “what is your name” and “how long are you visiting Thailand”, I was back on the road. About 10 km outside of Buriram, I came across the Khao Kradong Volcano Forest Park. In no real rush to get back to Buriram and needing a break from the motorbike seat, I stopped for a visit. The steep 101 step staircase lead to a very large gold seated Buddha keeping watch over the plains. The view from the top was impressive and dramatic as far as how quickly the dormant volcanoes rise from the flat plains. After a short tour of the few buildings situated around the Buddha statue, I made the much easier climb back down the mountain and back on my motorbike. Buriram is not really a city that draws a large number of foreign visitors. Mostly because Buriram offers very little to see. As I discovered in my almost 5 hours of walking around between Sunday evening and Monday morning. Setting out with my not-to-scale map that was really more of a suggestion of where streets are and how they are named, I began my tour of Buriram. Just to make navigating more interesting, typically only one of the two roads at an intersection were labeled. I either knew what street I was on and had to guess at the cross street. Or I knew what the cross street was but wasn’t quite sure I was on the street I intended to be on. I’ve also decided that sidewalks in Thailand are definitely not designed to be walked on. Uneven and often taken over by food stalls or various repair shops, it was generally easier at times to just walk in the street. Being a white foreign female in a town like Buriram, definitely draws some attention. Generally, I was greeted with curious looks that changed to a smile when I smiled at them and said “sawad dee kaa” (hello). Men would occasionally shout out a “hello”, to which I typically responded with “sawad dee kaa” or maybe just “hello” depending on the moment. The clearly drunk Thai male on the bicycle was the most interesting interaction. Holding his beer in one hand and pointing with the other, I think he was trying to suggest that he wanted me to take him to America with me. Finally I said I needed to go, so he shook my hand, said he loved me and I quickly went on my way. Reluctantly he turned his bicycle around and off he pedaled. If I had remembered to wear a t-shirt instead of a tank top, I could have gone in the two wats (temples) that are located in the main part of Buriram. To go into a temple, you are supposed to have your shoulders covered. So mostly I looked at the temples from the street. I did venture into the City Pillar monument. I refrained from going inside the building housing the 2 city pillars since I wasn’t sure if I was already being disrespectful by being in the monument area with my shoulders not covered. Returning to the project is like coming home. This visit being my third time volunteering at the Surin Project, I was mostly aware of the changes. A new concrete and tin roof shelter has been built for Tangmo, Wang Duen, and Nong Lek to hang out. A rebuilt structure for Jaeb, since she had been working intently on destroying her last one. And just like visiting home, I have stayed in the same room and the same house each time, although now Sing’s wife, Pi Jan, is the house mom. The week begins with an opening ceremony that is a combination of Buddhist and Kuy (Goi) beliefs. Lead by a shaman, the ceremony is a mixture of happiness and reverence. The purpose behind the ceremony is to bring us all together and to wish for us a healthy and good week. The kuy people believe in white and dark magic, so much of the ceremony is about bringing the white protective magic to all the people there. The ceremony is also the first time where all the volunteers get to meet the mahouts, the caretakers of the elephants. The aptly named Pan, Warin’s mahout, was sitting behind me. He remembered me from my last visit, greeting me with “MJ MJ”. Three times during the ceremony, all the mahouts throw mulberry leaves at us to bless us. Several meanings are tied to this blessing. The main meaning is to bring your spirit back to your body. The kuy believe that occasionally our spirits wander off to the forest. The mulberry tree has special magic and being blessed with them helps the spirit to return to the body. Another meaning is that someone who is blessed by these leaves will be great and will be loved. Pan, Thong Di, and Em were sitting behind me so I was greatly blessed with large handfuls of mulberry leaves showered on me with great force. A terrific welcome from the mahouts. The cast of characters, both elephants and mahouts, has remained mostly the same since my visit last December. 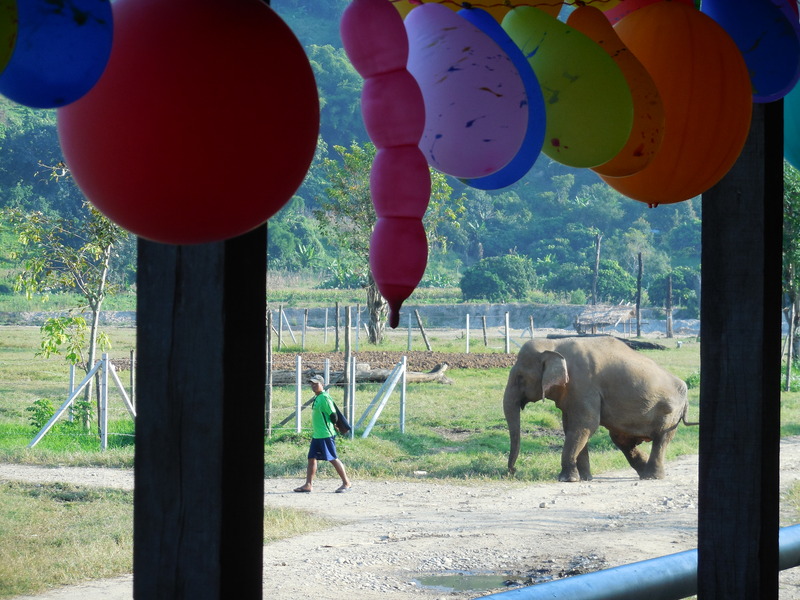 One new elephant, Wong Duen, and her mahout, Nei, have joined the project. Another elephant, Ploy, and her mahout, Sing, have returned to the project. Unfortunately, Ploy’s baby girl Kwan has not been allowed to come back to the project by the owner. And sadly, Sai Faa and her mahout, Dao, are not on the project at the moment because Dao is sick. Hopefully she will return to the project when Dao is better. From a project success standpoint this consistency is a good sign. Many mahouts have a difficult time with the rules imposed in their agreement to be on the project. One of the rules is that they are not allowed to use a bull hook, a 2 foot stick with a large metal hook attached to it, to control their elephant. Many mahouts view just carrying the bull hook as a talisman of protection from injury. To give up the bull hook is to give up the idea that they are protected from injury. Throughout the week we take several walks through the forest with the elephants. Generally, we try to stay out of the way of the elephants, not always easy since elephants move surprisingly quietly, and just watch them as they stop and forage for food, enjoying a tasty vine here or some other plant there. One of our walks takes us to a bamboo thicket. This particular day, Fah Sai was intent on having some bamboo as a snack. Sarot hurried us out of the way as she reached for a giant stalk. With a great crack she pulled it to the ground. While watching her and admiring her great power we were momentarily oblivious to the nest of red ants that we had ended up in. These ants are particularly vicious and bite with a vengeance. The ants seemed to drop off the bushes and crawl up from the ground, all the sudden appearing on shirts, in hair, on legs, everywhere. By the time we got out of the area I had eight major bites, one on my back the rest on my legs. Of course some work does need to be done during the week. Mostly in the form of morning and evening chores. In the morning, we have three tasks that our teams rotate through: cleaning shelters, cleaning the enclosure and cutting sugar cane. 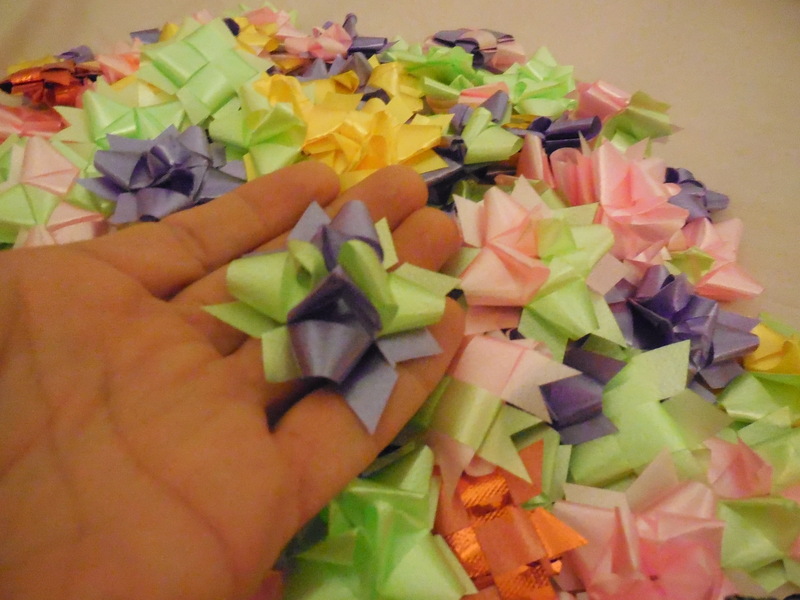 None of the tasks are particularly arduous, taking at most 30 minutes to complete. My favorite task is cutting sugar cane. Not only because I get to use a machete to hack down the 8 foot tall stalks of sugar cane, but also because I get to work with the mahouts. I am always amazed at the speed and skill with which they accomplish their task. Clearing away the dead leaves with a whoosh whoosh of their machete and cutting the stalk with a simple thwack of the machete. The mahouts are sweetly tolerant of my swoosh….swoosh as I copy them in clearing away the dried leaves and the thwack, thwack, thwack that it takes me to bring down one sugar cane stalk. The task is still sanook (fun) involving much smiling and laughing. 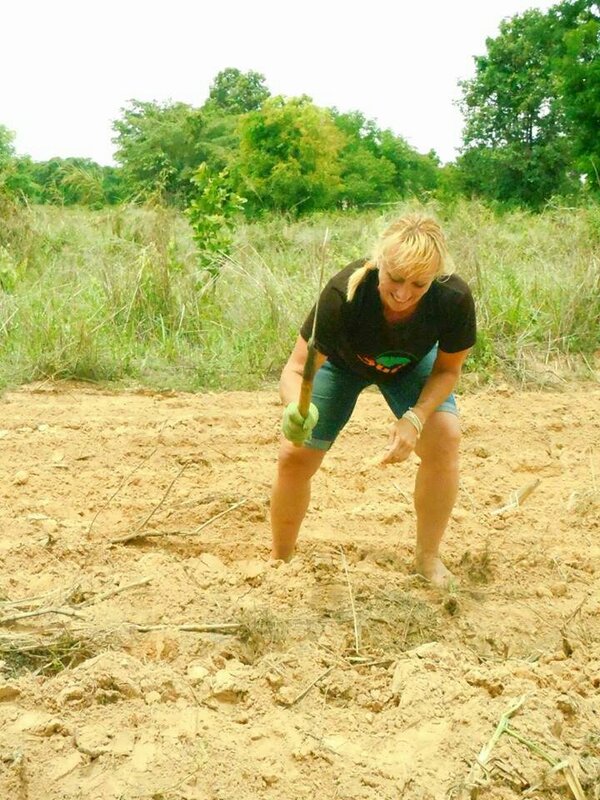 Our one project for the week was to help plant a field of sugar cane for the elephants. Sugar cane fields are planted by laying sugar cane stalks in furrows, cutting the stalks into about foot long pieces, covering them with elephant manure and then covering with the dirt. Any opportunity for me to use a machete is always welcome, so I volunteered to cut the sugar cane stalks. Careful to stand a furrow over from where I was working to make sure my bare toes were protected by a barricade of dirt, I made my way up and down the rows cutting the stalks. Using a machete effectively definitely takes consistent practice. Much more practice than my once or twice a year. Second only to getting to use a machete, the best part of doing this project was getting to walk barefoot in the soft freshly plowed field of red sandy soil. 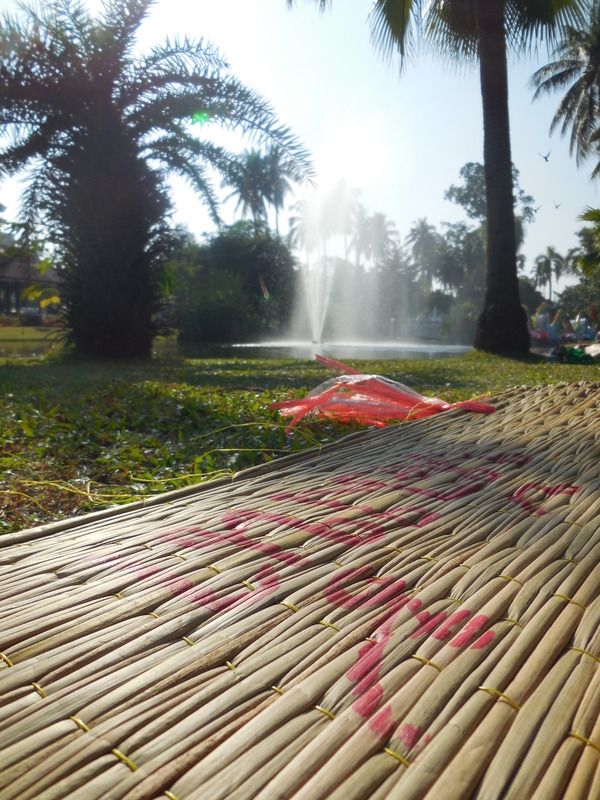 Coming from the dry climate of Colorado, the heat and humidity of Ban Tha Klang was on occasion almost stifling. Only one day passed without rain sometime during the day or night. The rest of the days included a rain shower, often in the late afternoon and occasionally well into the night. Instead of cooling the air, each passing afternoon shower seemed to leave the air twice as heavy and twice as hot. Rain showers at night were welcomed to keep the hordes of June bugs at bay and did actually make it a little more cool to sleep. All the moisture made the landscape of the village much more vibrant. The lush green of the trees and plants contrasted with the red clay soil provided a vibrant backdrop for our elephant walks. Especially our walks to the river through the bright green of the young rice fields. Add to this tableau the shades of grey and pink of the elephants, partially covered with the red soil the elephants use for sunscreen and bug repellent. Such a beautiful and refreshing sight. The heat and humidity also upped the number of bucket showers to be had each day. On average, I took 2 each day. Definitely a far cry from my last visit to the project where it was so cold that bucket showers were tolerated only when the amount of dirt became overwhelming. Scooping the cool water from the bucket and pouring it over me brought welcome relief from being covered with sweat, mosquito repellent and dirt. Regardless of how hot it was, that first scoop of water always brought the same cold shock of jumping into a cold body of water. And always felt so refreshing. The week for me this time culminated with the mahout dinner and the farang (foreigner/volunteer) show. The mahout dinner gives us a chance to spend time talking and laughing with the mahouts. Sitting next to Sarot, the head mahout, can always prove interesting. When Ocha brought the traditional dish made from beef throat, Sarot took a fork and put a piece of it on it, dipped it lightly in the sauce and handed it to me. I have always lived by the rule that I will try any food that is offered to me, a practice instilled in me by years of travelling with my dad. The meat tasted reasonably good. Probably wouldn’t eat a whole meal of it, but I did reach for a second piece after a while, making the mistake of dipping it too much in the sauce which left my lips tingling for quite awhile from the spice. A while later, Sarot again took my fork and gave me another bite. I also made the mistake of letting Sarot make my second drink of Hong Thong (a wiskey-esque alcohol) and soda water. I think it had more Hong Thong than soda water. The farang show is always good for some laughs. The girls performance was singing The Lion Sleeps tonight. Percussion and was provided by the collection of instruments we created out of a bamboo bin played with a stick, a piece of bamboo and a stick and two maracas made from water bottles and rocks. For only practicing once, we did great. Rob’s performance was sweet too. He made a rap out of all the information of the elephants and their mahouts. The mahouts always follow up with a performance, typically the frog mating dance. Even though I have seen it several times, I still don’t quite get it. No matter how many times I do it, the best part of the week is the chance to bathe the elephants in the river. Twice during the week we walk with the elephants to the river, spend a little time watching them eat the sugar cane, and then get in the river with them. In the water, each elephant gets its own bag of mangao, a cross between a turnip and a potato, and then the bathing begins. These massive animals so solid on land are almost buoyant in the water. Bathing Fah Sai was one of the most amazing elephant bathing experiences I have had in a long time. Fah Sai is the biggest elephant on the project. At 5’3″, I am roughly half as tall as she stands at the shoulder. Not a skinny elephant by any means, her mass leaves me awestruck when she passes close by. To get to play with her in the water was so incredible. After feeding her 2 bags of mangao, that Thong Di made sure each one was rinsed of dirt before handing them to me to feed her, Thong Di had her lie down in the water. I started splashing her with water and scrubbing her with my brush. To help me better reach her ear and other side of her face, Thong Di gave her a command to put her head down farther into the water. At one point I was practically on top of her head. The feeling of being so close to such a beautiful animal is hard to put into words. The heat of her body, the gentle breathing, the thick skin with the wiry hair, the power in her ears and trunk. By the end of the bathing, I was soaked from head to toe. Especially since Thong Di kept having Fah Sai bring water into her trunk and on command blow it at me. Each time the initial burst of warm trunk (nasal?) air preceding the blast of water from her trunk hitting me square in the face. I was all smiles sloshing out of the water beside Fah Sai, her wake making a ruckus in direct contrast to the stealthfulness with which she moves on land. People ask me what keeps me coming back to the Surin Project (or any of the elephant projects). Part of my response is to try to help change the culture of tourism in Thailand and to protect the elephants from abuse and harm that can come to them through elephant rides, circus tricks and trekking. What truly keeps me coming back is getting to experience the energy of these gentle giants. Elephants are empathetic and compassionate creatures. Experiencing their touch and looking into their eyes refills my heart and refreshes my spirit.